This is a 25 count ofr wire cork hoods. 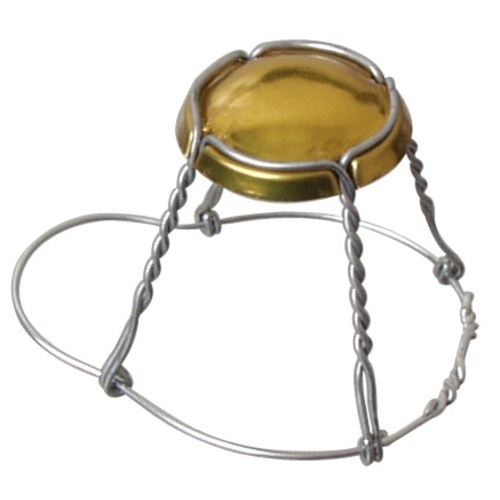 Wire hoods are a key part of any Belgian-style bottling. Not only do they complete the look of the bottle, but they are required to keep the mushroom cork in place once the carbonation builds up. Apply them easily with a Wire Hood Fastener giving the hood 5 1/2 turns. Great price when compared to other vendors. I have used them before and are good quality as well. For keeping the cork in the bottle. Going to bottle carb a funky saison. Worked great with the Belgian corks available on this site. I didn't have the proper tool to use with these bit a screwdriver worked in a pinch. No problems with them whatsoever. I will buy these again! These are made for carbonated wine, however I mostly use them when I bottle big Belgian beers. They work fine on both occasions and are strong enough that they can be reused once if you don't overtwist.